In the history of our city, we have never witnessed a payroll as high for Latino athletes that participate in professional sports as that of today. 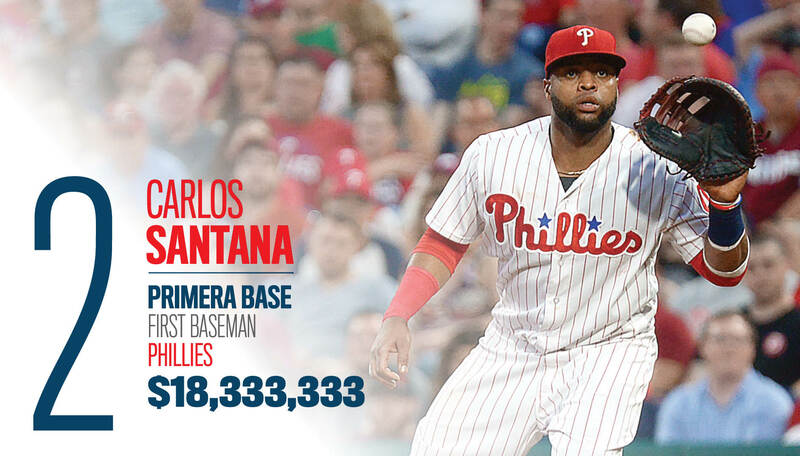 This season, more than ever, the Philadelphia Phillies rely on Latino players, and the results are impressive. Latino athlete payroll has gone sky high, but the on-the-field performance has been terrific as well. After six years in the bottom ranks of the National League East, Philadelphia is fighting head-to-head with Atlanta and Washington for its division crown. 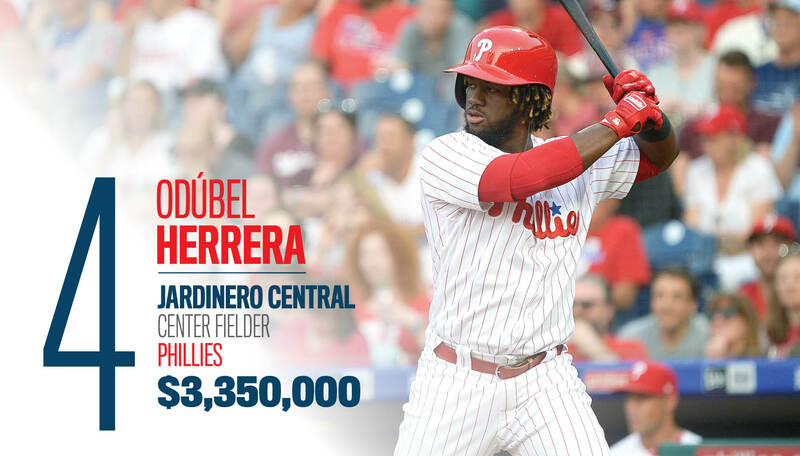 The Latino force that emerged in Philadelphia in recent years, led by Venezuelans César Hernández (second baseman) and centerfielder Odúbel “El Torito” Herrera, as well as Dominicans Maikel Franco (third baseman) and relief pitcher Héctor Neris, was spectacularly reinforced during the off-season by young general manager Matt Klentak — who in fact was born the year the Phillies claimed their first World Series championship (1980). He trusted two free agents with Latino blood in their veins to become the highest paid players on the team, acquiring sensational pitcher Jake Arrieta and solid first baseman Carlos Santana. Between them, they earn 40 percent of the team’s whole payroll. 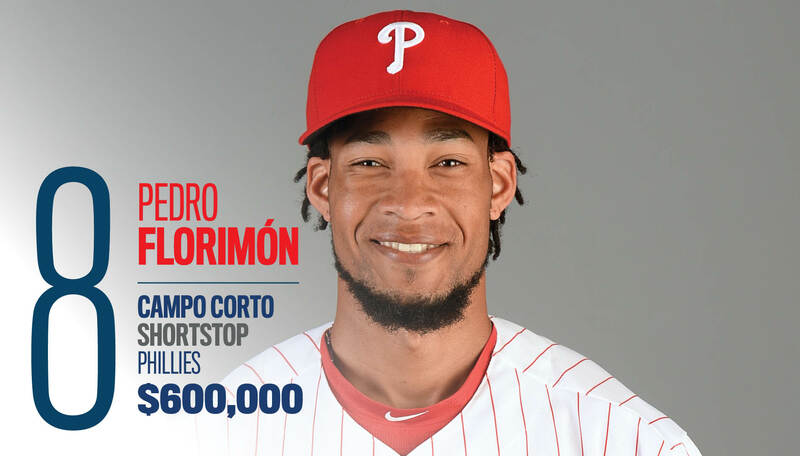 With these two signings, athletes born in Latin America or with Latino roots account for more than 57 percent of the total salaries received by the Philadelphia players. Yes, 57 percent! The figure leaves us speechless and, of course, this is the first time it has happened in our city. If we go back in history, it is easy to put things into perspective. The Phillies are fighting this season to be back in the World Series. If we go back to the two years in which the team won the Fall Classic (1980 and 2008), we can see that the Latino presence on those squads was very limited. In 1980, Venezuelan second baseman Manny Trillo was the only Latino in the starting lineup. One of the top players in his position, Trillo made $375,000 per year, but was not among the top paid five players in the organization. Other Latino players included Puerto Ricans Luis Aguayo, Orlando Isales and Ozzie Virgil. Each of them was making $30,000 annually, which, at the time, was the MLB minimum salary. In the glorious 2008 season, despite a lack of Latino prominence, two players with Hispanic blood were the key to the Phillies clinching the win in Game 5 of the World Series against the Tampa Bay Rays. Dominican third baseman Pedro Feliz produced the winning run in the bottom of the seventh inning. Puerto Rican reliever J.C. Romero was awarded the victory. He finished the series with a 2-0 record. Romero was making $3.25 million and Feliz $3 million. Their salaries combined were less than 5 percent of the club’s total payroll. After the way the Phillies moved in the winter market, it was clear the team was looking to make this season the big jump to help the fans forget the horrible recent years. Klentak landed Arrieta, the top free agent available. The star pitcher signed a $75 million three-year deal, including a salary of $30 million dollars in his first season with Philadelphia. With this deal, the starter became the highest paid player ever in a single season for the Phillies. Arrieta is also the fourth-top paid player in all of baseball and the highest earning Latino tied with veteran Venezuelan Miguel Cabrera and Dominican Albert Pujols. The Philadelphia star will also receive more money than Comcast’s CEO Brian Roberts, who made about $27.4 million in 2017, according to the fiscal list published by the company on its website. Arrieta’s presence and the managing of new skipper Gabe Kapler have produced a huge spark for a team that started the season very well and has remained at the top of its division. Arrieta, who won the National League Cy Young award with the Chicago Cubs in 2015 and led the team to their first World Series championship the following season, has given balance to a pitching staff, the openers of which are working very effectively. The right hander from Puerto Rican background ranks second in the club amongst starters (trails only new baseball sensation Aaron Nola) with an earned run average allowed below 3.5. Nine of the 10 highest paid athletes that participate in team sports belong to the Phillies organization. The other one is Philadelphia Union’s Alejandro Bedoya, who comes from a Colombian background. Bedoya, a solid midfielder who has participated in 52 international games with Team USA, including the 2014 World Cup held in Brazil, left Nantes of the French league to become the Union’s icon in August of 2016. In eight MLS seasons, Philadelphia has never been among the elite of U.S. professional soccer. The Union has only made the playoffs twice, being eliminated both times in the first round, and has never qualified for the CONCACAF Champions League. It is true it has reached the Open Cup final game twice (losing on both occasions in 2014 and 2015), but it is also true the Union should look more to what the Phillies have done lately, shifting their lineup to have more Latino players. Results would come for sure as the level of soccer played under the U.S. border is one of the very best in planet football. 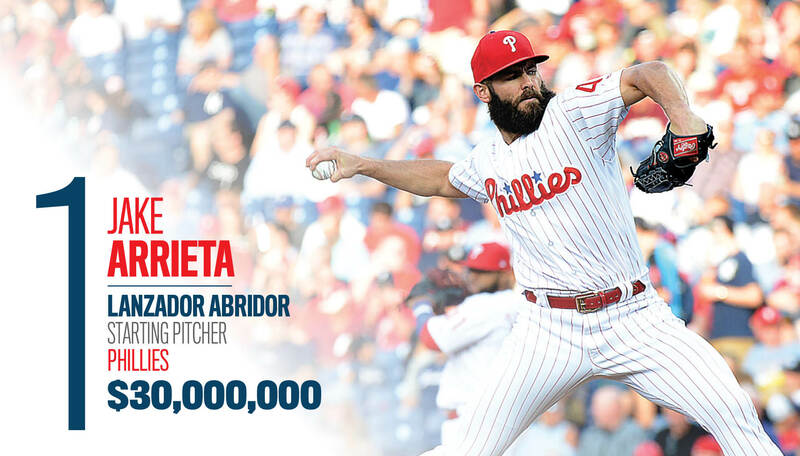 On March 12, 2018, the Phillies reached a three-year deal with Arrieta that will give the starting right-hander a total of $75 million dollars ($30 million in 2018, $25 million in 2019 and $20 million in 2020). 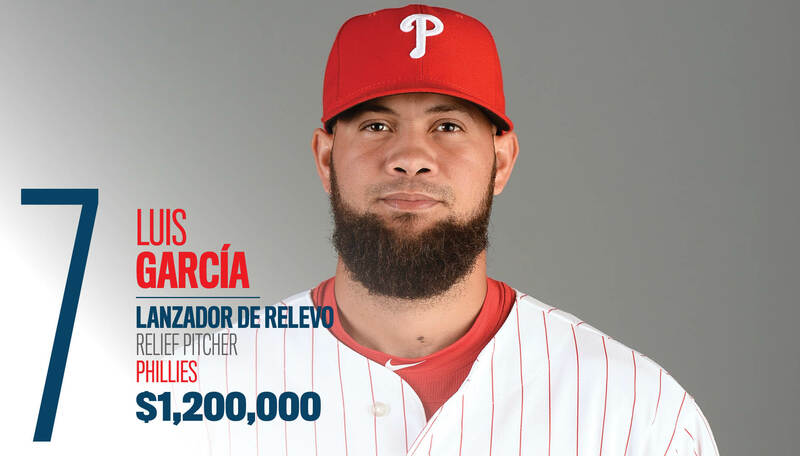 With this deal, the 2015 National League Cy Young winner becomes the highest paid Philadelphia player in a season. Arrieta, the top player in the last free agent market, chose the City of the Brotherly Love above many other options. The pitcher has Latin blood in his veins as one of his grandfathers was born in Bayamón, Puerto Rico. He made his Major League debut with the Baltimore Orioles in 2010, where he played four seasons. He gained huge recognition as a member of the Chicago Cubs, posting a sensational season in 2015 with a 22-6 mark and a 1.77 ERA, which earned him the Cy Young conquest. The following year Arrieta led the Cubs to the first World Series championship of the team’s 108-year history. He played a key role in the Fall Classic come-from-behind victory against the Cleveland Indians, winning Games 2 and 6. Despite being born in Farmington, Missouri, on March 6, 1986, Arrieta received a call to play for Team Puerto Rico in the 2017 World Baseball Classic because of his Latino roots. “It is an honor to be asked to play for Puerto Rico,” the star player said. Finally, Arrieta decided to rest and focus on the MLB season instead of taking part in the international tournament. After eight seasons with the Indians, Santana became a free agent. Last December, he signed a three-year agreement with the Phillies. This season he will make $15 million dollars on base salary plus a signing bonus of $3,333,333. Santana was born on April 8, 1986, in Santo Domingo, the capital of the Dominican Republic. A solid acquisition, he is an effective hitter in the top of the lineup thanks to his ability to bat from both sides of the plate. 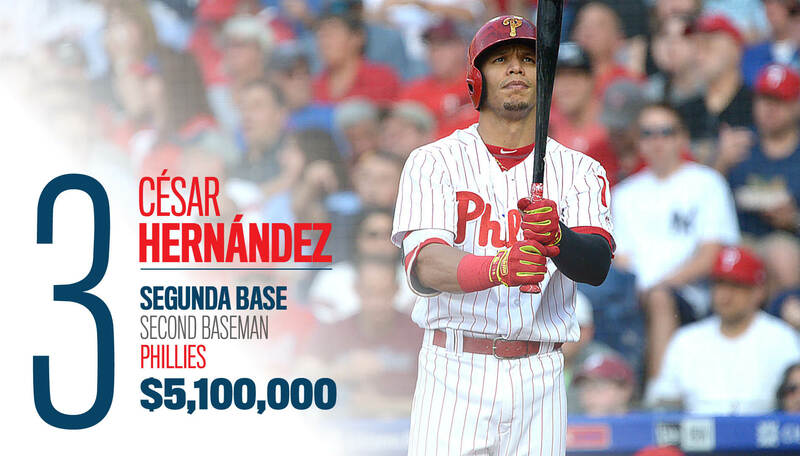 Hernández, who was born in Valencia, Venezuela, on May 23, 1990, joined Philadelphia’s development system when he was only 16. Since then, he has climbed the ladder of success until becoming one of the most consistent hitters of the National League. Hernández, who has a career batting average above .280, leads off the dynamic Phillies lineup. In his sixth season in the Major Leagues (all with Philadelphia), he is looking to reach 150 hits for the third consecutive year. Very few players have improved as much in recent years in the Major Leagues as Herrera. Born in San José, Zulia, Venezuela (December 29, 1991), he made his debut with Philadelphia in 2015. Besides becoming one of the most feared hitters thanks to an exceptional start of the 2018 season, Herrera excels on defense covering center field for the Phillies. This year, in addition to a base salary of $3 million dollars, he received a signing bonus of $350,000. Like Hernández and Herrera, Franco has only played MLB ball with Philadelphia. Born in Azua, Dominican Republic (August 26, 1992), he has a special hitting power and is in pace to record more than 20 home-runs for the third straight season. 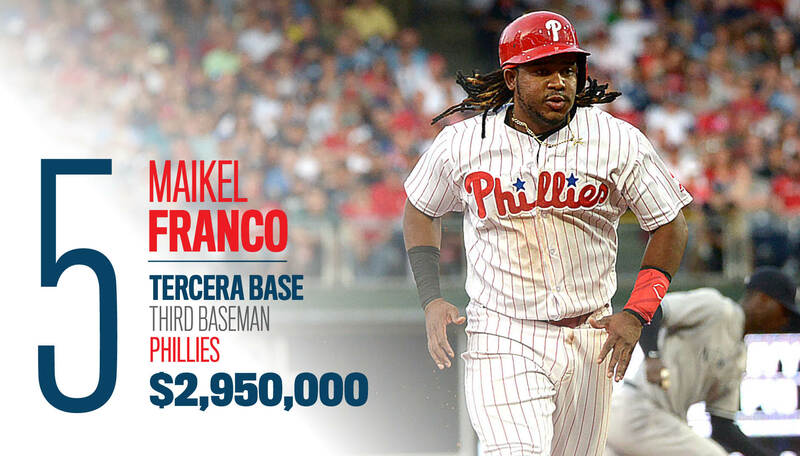 Franco signed with the Phillies as an international free agent in 2010, receiving $100,000 dollars. In 2014 he made his debut and four years later he is making almost 30 times more as the fifth highest paid player in the organization. The son of a former Colombian soccer player, Bedoya was born in Englewood, New Jersey (April 29, 1987). After growing up in Florida, he decided to try the beautiful game in Europe, where he played in Sweden, Scotland and France. He earned a spot on Team USA for the 2014 World Cup. Two years later, he signed with the Union. 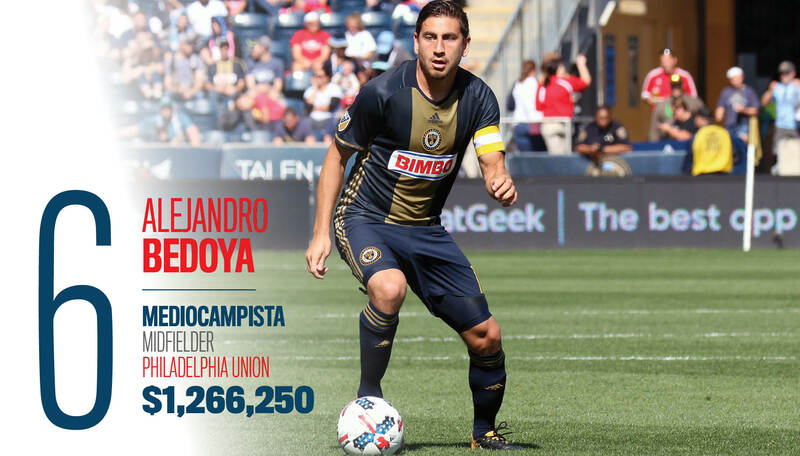 Bedoya currently makes $1,266,250 ($1.2 million base salary plus incentives). He is the second highest paid player in the Philadelphia squad. Showing an amazing spirit of fighting and sacrifice, García, who was born in Santo Domingo, Dominican Republic, on January 30, 1987, has found success in his second stint in the Major Leagues. After failing to make the rosters of the Dodgers and Nationals (2006-2010), he left baseball and opened a barber shop in New Jersey. He was then signed in 2013 by Philadelphia, where he has become a key element among the club’s relievers. Philadelphia is the fourth MLB city where Florimón has played. Born in La Romana, Dominican Republic (December 10, 1986), he brings eight years of experience in the Major Leagues, where he made his debut with Baltimore in 2011. Florimón represents the player every team would like to have on its roster. An excellent replacement, he can play almost every position, including pitcher. In fact, he has taken the mound twice for the Phillies this season. 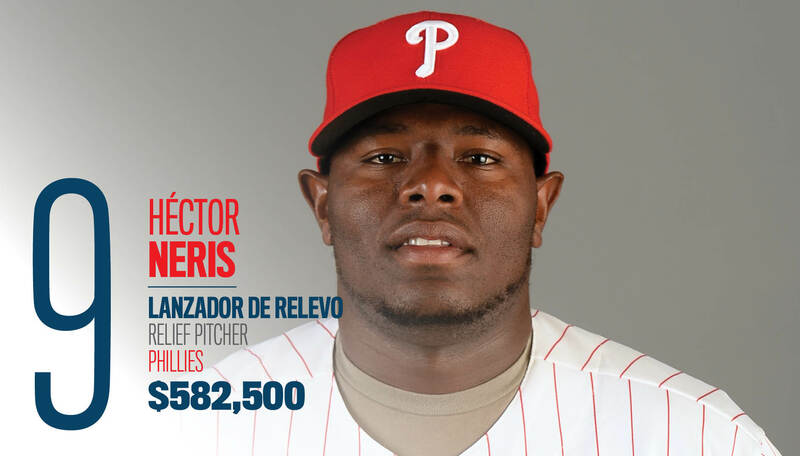 After a solid 2017 season, in which he saved 26 games in 29 chances, Neris, who was born in Villa Altagracia, Dominican Republic (June 14, 1989), started 2018 as Philadelphia’s top reliever. However, things did not work out as expected. He registered 10 saves but also missed three opportunities and collected a horrible 6.90 ERA. The Phillies ended up demoting him to the Minor Leagues, where he is hoping to get back into last year’s form. Born in Montclair, California (June 7, 1992), this brave player with Mexican roots who overcame an early Tommy-John elbow surgery is one of the main prospects. 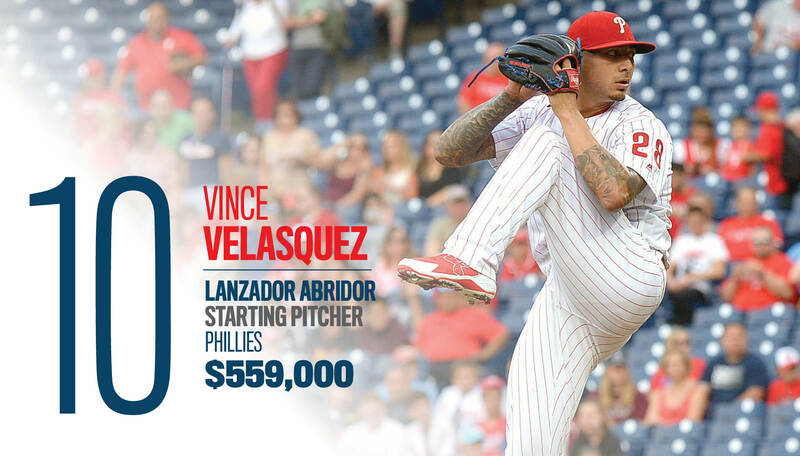 Velasquez, who started his career with Houston in 2015, joined the Phillies a year later and quickly showed his great pitching skills. On April 16, 2016, he blanked San Diego, 3-0, delivering 16 strikeouts to fall only one shy of the club’s all-time record in a game.